Sliding or Slider windows are a type of window that has two or even more slightly overlapping sashes that horizontally slide within the frame. One of the sashes is fixed while the rest can glide to the left or right sides of the frame through detachable rollers. By moving horizontally, sliding windows do not go against gravity and do not have failed springs. It is more convenient to use in patios where they do not pose as obstacles to people walking in the vicinity. It is also good to use in kitchens, where sliding panes work more conveniently in providing ventilation. They are an ideal choice for those in highly populated areas because they do not obstruct traffic flow. These windows are easy to use and install and is suited for areas where the weather frequently changes. To ensure that the sliding windows deliver the best performance, choose a reliable contractor who will install the windows. The choice can come from a list of recommendations from relatives, neighbors and friends. Consult authorities such as the Better Business Bureau and the Association of Window Dealers and Installers to check on the contractors’ performance. The cost of sliding windows ranges from a hundred to a thousand dollars depending on the materials, the design and the window size. Decide on the budget and make sure that the contractor stays within this budget. It is important to discuss the terms, scheduled completion, payments scheme and possible insurance with the contractor before signing the contract. The best choice is the one that offers long-lasting high-quality performance. Choose brands that offer more efficient energy glass and better seals. As a guide, choose the ones that meet the EnergyStar standards of performance. Choose window glass options that meet the homeowners’ needs. Whether the glasses are made of Low E, double-pane or triple-pane, the choice highly depends on the insulation and protection capability that can satisfy the customer’s needs. 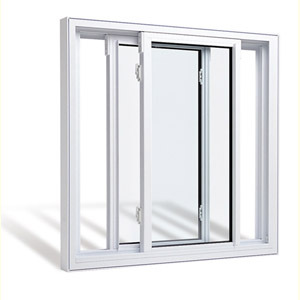 Simonton is a well-known manufacturer of sliding window products, like the Reflections 5050 Series 2-Lite. It features a 3.25 inches deep vinyl frame with a right and left sashes that have been welded together for extra strength. It offers double pane glass for better insulation. Its sash can be lifted up for easy cleaning purposes. It is equipped with a half screen made of fiberglass. The Reflections 5500, on the other hand, uses a Low-E Soft Coat argon-filled glass. Its deep frame is also attached to the sash. Besides the dual pane, 3/4 inch glass unit, and fiberglass screens that are found in Reflections 5050, it offers a double cam lock. NewSouth windows is another leading manufacturer known for its 2000 and 7000 Series Sliding Windows. The 2000 series offers 7/8 inches of thick insulated glass, tilted and welded sash, angled sill, lock Vent with interlocking pane meeting rail and a fiberglass-made half screen. All these features are also found in the 7000 series. An added feature is the use of titanium glass Ti-AC36 that is argon filled. By submitting, you authorize up to 4 home improvement companies and our partners to call you on the wireless or landline phone number provided to discuss your project. You understand that some may use automated phone technology including text messaging to contact you and that you are in no way required to purchase any products or services from them. It's entirely your choice. How much will Window Replacement cost you?